I volunteered to serve on the web committee of the Southern Chapter of Medical Library Association (SC/MLA) this year. 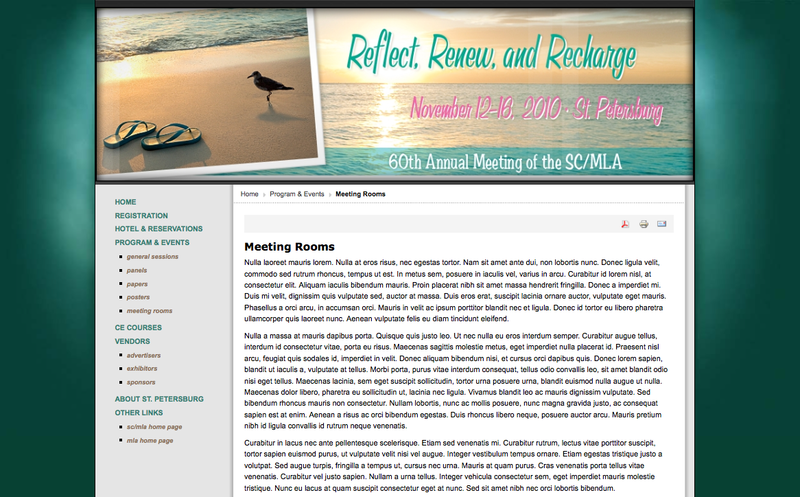 The work I do as the co-chair of this committee is to create a web site for the 60th Annual SC/MLA Conference. The idea of using Joomla for the conference site came from the folks at the Shimberg Health Sciences Library of Univ. of South Florida who use Joomla for their library site. I have heard about Joomla before but never tried. I heard a lot about Drupal and WordPress at library conferences but not so much about Joomla. Well, I spent a few days – three days to be exact – working with a Joomla site, and I am very much impressed. Joomla is easy to learn, and I love the fact that it comes with so many useful modules which can be configured and used pretty much out of the box. There are also many free template extensions that can be directly plugged in to create a nice web site. I picked a template and an extension for the banner image, installed and configured the settings, did some CSS editing to customize the overall style of the site, added a bunch of pages with lorem-ipsum content, activated a couple of useful modules such as breadcrumb and footer. That’s pretty much all I have done and Ta-da! I am a web admin at work but we don’t use a CMS. Now if we ever migrate the site to a CMS, I will shout for Joomla. If you are looking for a content management system (CMS) that is free and easy-to-use, Joomla is definitely something to consider. Interested? Check out the Showcase of the library Websites built with Joomla. So finally it came. The long-awaited iPad. I got this as a birthday present from my husband. So I can’t really say that I was committed to purchase this gadget myself. I doubt if I would have spent that much $$$ although the model I got is the lowest spec (16GB wi-fi access only). But of course, my wiser half was convinced rightly that I would want one. It arrived yesterday morning with a honk from a UPS truck. I wonder how many same iPad packages the UPS driver delivered that day, but I am pretty sure he had a good idea about what was going on. So to cut to the chase, this is how it looks. My iPad. I think I am relatively happy with it although I am not sure how successful it would be as a eBook reader and a PDF reading device, which are the features that I was most looking forward to test. Actually, now that I have spent two days with it, I think I will use the iPad more for watching TV shows/movies (Surprise I rarely watch videos on the computer!) and surfing online. I am not sure if I will use the iPad for any type of serious work other than PDF reading. But the App Store is showing all three productivity apps for the iPad with very high ratings. So I am holding my judgment on this. The iPad is not as light as I would like, but about half the weight of my small netbook, which can make a big difference when you are traveling. It seems to be pretty sturdy but the screen is very glossy and gets a lot of glare used outdoors or under direct lighting. It is quite fast and the battery seems to last long enough to last the working hours from 8/9 to 5 without recharging. 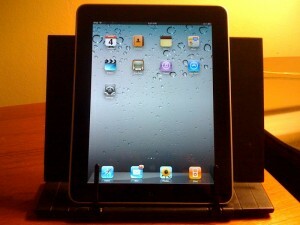 The screen keyboard is usable when the iPad is in a horizontal position but is too sensitive. Lots of typos ensued when I tried to type. The keyboard inputs letters every time the fingers brush on it. Personally, I am very much bummed about the fact that iPad doesn’t support as many international keyboards as the iPhone does. What this means to me is that I can’t write emails and create documents in Korean. Although this may be a feature that is not widely used, the ease of switching keyboards for different languages was one of the features that distinguished Macs from PCs. I don’t think the iPad will replace my smartphone. Checking emails, Twitter, my calendar, to-do-list, making short notes, taking photos and videos will still be the tasks I perform mostly on my smartphone when I am not using an iPad already for something else. But then there is a chance that I may use the iPad a lot. Iin that case, I will perform these tasks on the iPad rather than on my smartphone. It is to be seen later. So the question boils down to this: would it be a good reading device? Depending on that, I may or may not carry my iPad around. Yes, you can see your finger prints all over when the light hits the screen. I took it out to the outside. Under the daylight sun, I could see my face and background reflected as if it were a black mirror. The iPad in a box comes with a power code/plug, a tiny little instruction, and nothing else. Not even a cheap wiping cloth. I wasn’t sure what I was going to do with my iPad. My plan was to think about it once it arrives. Well, I had a very difficult time to get it to work and had to spent hours grumbling. As soon as I unboxed the shiny new iPad, of course I plugged right into the power outlet thinking it will work automatically. It didn’t. Instead, it showed the sign that I have to hook it up to iTunes first. The instruction also said that I should first download the latest version of iTunes. This took a very long time. Finally, I was done, I hooked up my iPad. I only got an error message saying an iPad requires Mac OS leopard or higher. I got only Tiger on my Mac desktop and haven’t updated it. Wouldn’t it have been so nice if Apple put that on the instruction sheet? So I took out my Mac laptop (I know I just have so many computers), which has Leopard, downloaded iTunes again and hooked it up. It worked. But if the iPad is going to work for grandmas and grandpas, they will definitely need some help from their granddaughters and grandsons. It is quite accurate to think that an iPad is a big iPhone with limited functionalities but with a bigger screen. Initially my response to an iPad was lukewarm. It didn’t seem to do anything special that I couldn’t do with my iPhone and a netbook. Well, that was my thought until I downloaded the ABC player app and watched a few episodes of FlashForward and Modern Family. IPad rocks as a video player. The screen is awesome for playing a video and the lack of keyboard is a huge advantage in this type of use. I could watch a TV episode lying down on the couch holding it against a cushion. It gets a bit heavy on the wrist after a while, and you may want a holder. But there is no sitting required to watch a video when you use an iPad. This was something I didn’t think that I would use an iPad for. I was impressed how well it works as a video player. The Apple store is also selling a VGA cable to connect an iPad to a TV. I am not sure if it can transfer the audio as well as the video. But I think I may also try that in the future. 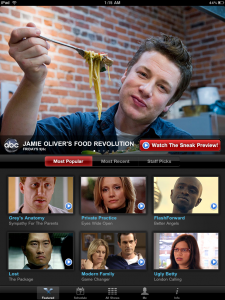 Try the Netflix app and the ABC player app for this if you have an iPad already. The only issue I found in video viewing was the shiny surface. The touchscreen is the best if it is used indoors without direct lighting that will cause annoying glare. For videos that are online, however, the iPad is unable to play any Flash files although it plays MPEG4 files well. 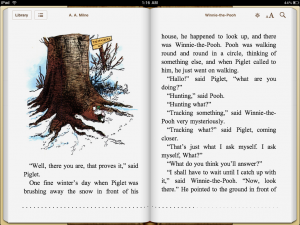 I wasn’t terribly impressed by iBooks, which comes with one free book, Winnie the Pooh. (There are more you can download.) There was the obvious advantage of having a larger screen and being a tablet rather than a computer with a keyboard. 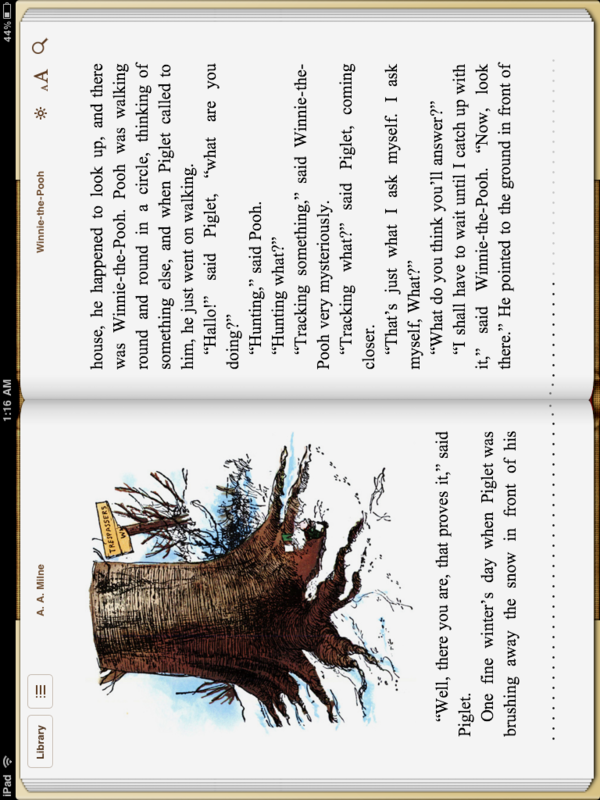 But I could not zoom in and out freely in iBooks as I did using Safari. IBooks only offer two font sizes. Also, as a reading screen, an iPad is no different from a computer screen except that its surface gets a lot of glare which would make lunchtime reading outdoors challenging. The iPad screen doesn’t use the e-Ink technology, as many noted, and so, is hard on the eyes for prolonged reading. The iPad also seems to lack the accessibility feature of reading out the content of an ebook in iBooks or of a web page in Safari like the iPhone 3GS (although I am not 100% sure). The iPad also is equipped with much-touted iPhone OS’ accessibility features that allow zooming in and out of the screen itself rather than the fonts and make the content on the web read aloud. In order to use this features, one has to go to the Accessibility tab on the Settings. Make sure to double-tap with three fingers when you want to return to the normal screen after you turn on the zoom function. IBooks also doesn’t allow highlighting and notes-adding feature that the Kindle iPad app offers. And finding a free eBook for iBooks is not as intuitive as it could be. (One needs to go to the App Store first. ) I liked the dictionary function of iBooks a lot but was disappointed that there was no way to use the dictionary as a stand-alone app to look up whatever word I would like. I thought this was very odd. Overall, I was more impressed with the Classics app on the iPhone, which is pretty much identical with iBook except that iBooks lacks the page-turning sound (again, such a shame! the sound makes a big difference). The iPad hasn’t yet changed my preference for reading a book in paper whenever possible. I think eBook readers have still a long way to go to become even a remote competitor with books in paper. 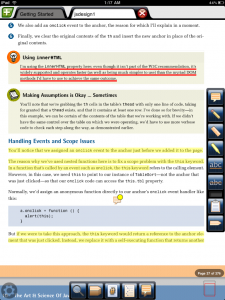 Reading PDF files is one of the big reasons that made me to get an iPad. But in order to do that, you need to get an app. The iPad allows you to read PDF files online but not to download them on the iPad, which seems to me to be ridiculous. I purchased GoodReader which allows syncing with Dropbox, Google Docs, Box.net, etc. It also allows you to directly search and download PDFs onto iPad from the web. But I realized that in order for me to save trees, I need to be able to annotate on the PDF files that I read. So I got iAnnotate for that purpose. Both apps work well, and iAnnotate also supports downloading the annotated pdf file back to the computer although I have not tried this yet. The only issue with iAnnotate is that it doesn’t sync with Dropbox or Google Docs and you have to manually upload documents to the iAnnotate application on your computer. I am hoping that iAnnotate adds the sync feature with Dropbox in the future. While the iPad is so-so as an ebook reader and it is yet to be seen if it will be good for PDF reading/annotating, it works quite well for online surfing and casual reading onthe web. 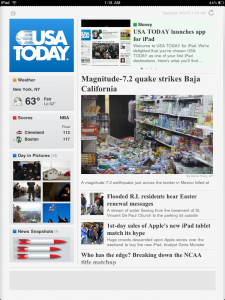 The USA Today app almost makes you feel as if you were reading a newspaper in paper again. The BBC News app allows one to easily browse news and plays video in a news article. I have only tried Scrabble on the iPad, but I think gaming on the iPad will be quite cool since it will provide a larger screen to fill with images and may well provide a more intuitive control for games. I think it would be addictive if a good role-playing game comes out for the iPad but any simple games will be fun as well. I think that overall the iPad is an interesting device and that the large part of its success will depend on the apps that can take advantage of the unique features of this device. I am disappointed, however, to find that Apple is offering a lesser version of the iPhone OS for the iPad with the limited number of international keyboards. As also noted by many, the way Apple designed the iPad to run the silos of applications that do not talk to each other becomes glaringly annoying as one needs to save multiple copies of one and the same file to use it for different applications. One copy for iAnnotate. Another copy of the same file for GoodReader. You get the idea of how inefficient and stupid this is. The iPad also makes it a huge pain to import and export any files. Why no way to exchange files directly between at least the iPad and the iPhone? Lastly, it will be interesting to see how publishers and news media will provide content to the iPad users. Already the TIME magazine packaged their weekly magazine as an individual app and priced it for $4.99 in the App Store. This caused a lot of complaints from users who didn’t realize that they were purchasing only one weekly magazine. The Wall Street Journal app also requires its users to create an account even for free content, which I found to be annoying and disturbing. I gave a presentation on the Handheld Librarian Online Conference on Feb. 17, 2010 with the title of “Mobile Access to Licensed Databases in Medicine and Other Subject Areas,” with my colleague, Marissa Ball. (Unfortunately the archived recording is not available for the public and I can’t even access it…) We also gave the same presentation in DCLA (Dade County Library Association) Fair on Mar. 31, 2010. While we had almost four hundred attendees in the online presentation, we had the audience of a dozen librarians at the local DCLA fair. We loved having presentations with librarians in a virtual as well as a physical space. The experience was interestingly different. In the presentation, we focused on the current status of mobile access to licensed databases. It is worthwhile to look at what is happening in medicine regarding mobile resources because mobile devices were introduced in medicine much earlier than in other areas and are more widely used. There exist more database vendors in medicine and health sciences that offer mobile resources, and medical and health sciences libraries are more familiar with offering and supporting mobile resources for library users. In medicine, the use of a mobile device and mobile resources also provides unique benefits by bringing up-to-date information at the point of care to help healthcare practitioners to make an informed clinical decision. Interestingly, however, there seem to be no such unique benefits from using a mobile device or mobile resources in humanities or social sciences that are comparable to those found in medicine. Hence, the question is if mobile resources and devices will eventually play a unique role in teaching, learning, and research activities in areas that are not practice-based as they are in medicine. we expressed an optimistic view on this question since mobile devices can allow students to learn, teachers to teach, and researchers to research using mobile devices in a way that is completely different from the way they currently do using desktop computers. What do you think? Here are the presentation slides and also a very inspiring presentation by Dr. Ivor Kovic in Mobile Monday in Amsterdam.